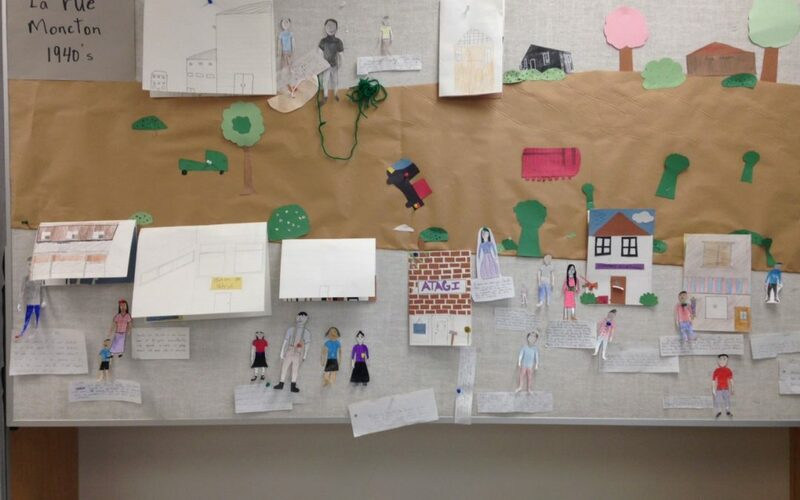 I got the chance to interview Laura de la Salle, a teacher at Sherwood Park School in North Vancouver, who recently used the Landscapes of Injustice teaching resource pilot in her classroom with partner Sarah McCurdy. She shared with us their finalized module and how their students interacted with the material, including photos. Hi Laura, would you like to tell the readers a little bit about who you are and what you do? I am a grade 6/7 French immersion teacher at Sherwood Park School. I met Mike Abe and Natsuki when my daughter started her studies at UVic and they were kind enough to give her a tour of the campus and history department. When I heard about the project, I asked if they would share the module with me to try in my French immersion class. I ended up collaborating with my teaching partner, Sarah McCurdy to have our classes study the Japanese-Canadian internment together. Jumping right in, how familiar were you with the subject of Japanese-Canadian internment and the dispossession? How did the LOI teacher resource package help you conceptualize, and then create, your classroom module? I was already very familiar with the Japanese-Canadian internment but have never taught an in depth unit on it. In fact, my daughters who are in their teens, have never learned about this subject in school. The resource package was a fantastic guide and launching pad for the unit. We basically followed the same ideas and integrated multiple disciplines into our unit. 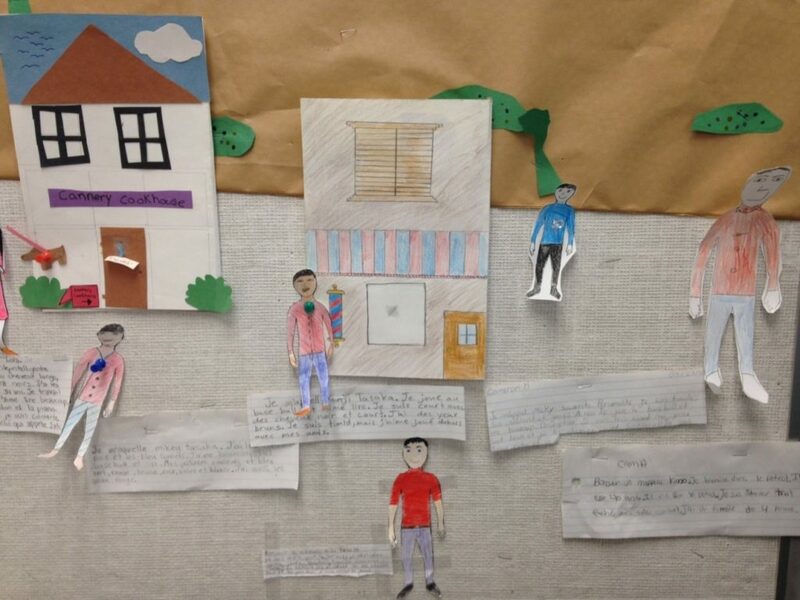 Your lesson plan distinguishes itself from the provided resource in that the neighbourhood simulated in your classroom was one in Steveston rather than in Powell Street. What was the reasoning behind that choice? Did you feel it worked well? Would you recommend fellow teachers consider adapting a similar model if they are located near another study site, such as Haney or Salt Spring Island? I chose Steveston because of my connection with my neighbour, Linda Ohama*. We had talked about bringing my class to Steveston a few years ago. A personal connection was key to the success of the unit. Linda came to our classrooms and saw the work we had done in preparation for our field trip. I highly recommend other teachers finding a way to make the unit their own with any people or places they can find so that the unit is as authentic as possible. At the Britannia Shipyards National Historic Site, Linda gave us a personal tour of the Murakami home and showed her film, Obachan’s Garden. It was very meaningful to the students to view the film in the actual place where the Murakami’s story begins. I recommend visiting the site. The school programs are worthwhile and it is also open to the public. How did your students react over the course of the module? Did any activities or discussions in particular resonate with them? Were there any surprising responses/reflections? 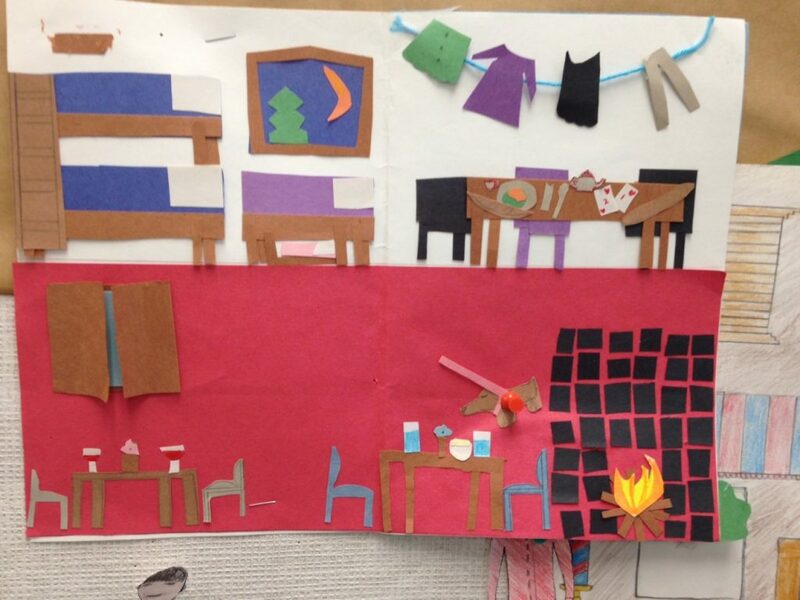 I love how the unit begins with the simulation where students make homes and develop character avatars. (In future I would like to spend more time at this stage for students to get a better understanding of life in the 1940’s with some personal anecdotes so students could develop their avatar characters and story line more). Rather than just learning the facts around a subject, students began to empathize more and more with the people. Students were encouraged to make personal connections throughout the study. They were appalled at the propaganda posters of the time. That led into a big discussion about current events and “Fake news”. 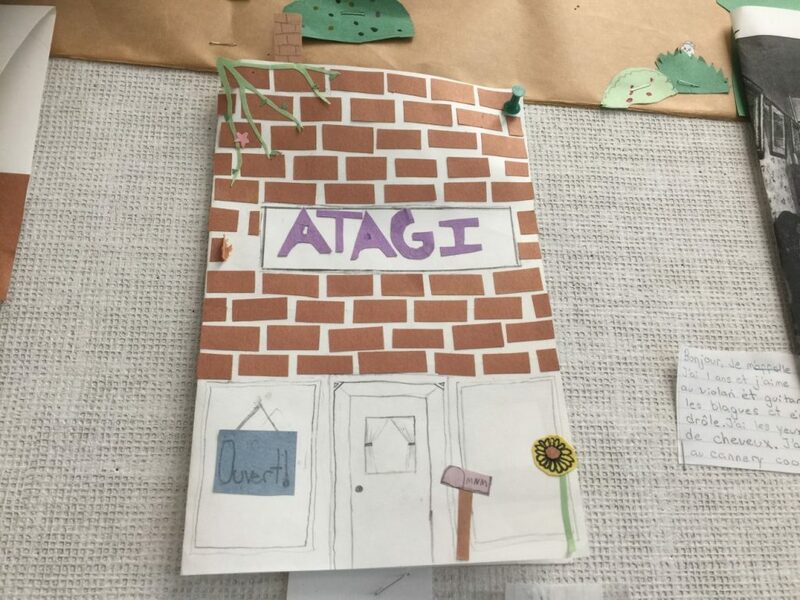 Another section that resonated with students was the section we added about the Japanese Canadians being sent to Hastings because that location was closest to our homes in North Vancouver. The students had been on a field trip to Playland last spring so were familiar with the area. Looking at photos of rows of beds at Hastings, students also made connections with Residential Schools and the treatment of Aboriginals. The lesson on the apology also touched on Reconciliation with First Nations. There are so many important facets of this module that transcend time and place. Are there any changes you would like to implement after completing the module for the first time? Are there any suggestions you would make for the LOI teacher resource package? Do you have any advice for teachers looking to try the resources themselves? It is a fantastic resource and easy to follow. Teachers may say that the subject of the Japanese-Canadian Internment is a minor suggestion in the new BC curriculum and there isn’t enough time to cover the event in detail. What’s important to note is that the whole module doesn’t cover only one Social Studies’ concept. It is truly a multi-disciplinary unit that touches a huge range of competencies (skills). In our unit, I added in all the big ideas and competencies that we touched from almost every subject. It was helpful to teach the unit with my teaching partner, Sarah, but we could have used more time to collaborate as we bounced ideas off each other and translated some of the lessons in French.. We often team taught both classes together. Thank you to you for sharing the resource with me. The students and I were very engaged in this study which is still very pertinent today. I hope our extensions are of benefit to your team. *Editor’s note: Linda Ohama is an award-winning Japanese-Canadian independent documentary filmaker, writer, educator, and visual artist. Known for her docu-drama, Obachan’s Garden, Linda has an extensive hisotry of integrating community, historical, and social justice initiatives in and around her films. Teachers: Please contact us at info@landscapesofinjustice.com if you have used the teacher pilot lesson plans. For those interested, we aim to have them available in Spring 2019. Very fine account and I look forward to more.